The Lamborghini, donated to Pope Francis was sold at auction for more than twice as much as money was hoped. The proceeds went to different charities of the Pope's choosing with most helping victims of the "Islamic state". 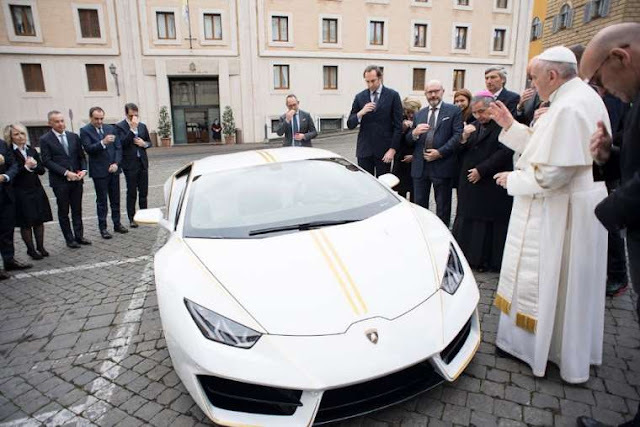 The Lamborghini, which Pope Francis received in November from the manufacturer, has been auctioned for 715,000 Euros. The auction occurred in Monaco, for the 580-hp sports car model Huracan RWD Coupe. The starting price was 150,000 Euros. At the auction in the Grimaldi Forum in Monaco, only a few cars achieved more than the estimated price. Of the proceeds, according to Sotheby's 70 percent - 500,500 Euros - go to the survivors destroyed by the "Islamic State" Mosul in northern Iraq. The remainder is divided equally between projects in Central Africa and a medical and social aid organization. The Pontiff, Francis had signed the sports coupe with a paint pen on the hood. The car was practically new and had not been driven since then. The Pope usually uses a Ford Focus from the Vatican company car fleet.